Ah, the good old chef salad. It's easy to forget about, isn't it?!? If you haven't thought of a chef salad in a while, you are in good company. I'll admit, it's one that I sometimes forget about as well..but it's a terrific way to use up that lunchmeat that you know is gonna go bad. Plus, you don't feel bad about eating all of said lunchmeat because there's the word "salad" in it. 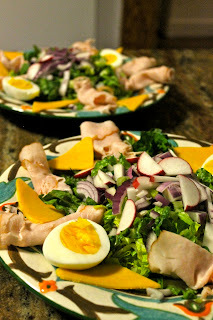 Another point of about the chef salad is that it's pretty to look at. I like arranging all the elements of the salad and looking at them and saying, "WOW! That is one symmetrical salad!" Makes me feel good. I didn't take a step by step picture diary of this quick fix. Call me crazy, but I somehow think you guys may know a thing or two about cutting vegetables and rolling slices of meat. So, in the name of common sense, I am just going to talk about the salad rather than show you pictures of me chopping onions and stuff. There are basically two elements that make a chef salad, in case you were wondering, like I was. That is the lunchmeat (it can be roast beef, turkey, ham, you get the picture) and the hardboiled egg. I love hardboiled eggs on my salads. I determine the level of fanciness of a salad by whether or not it contains a hardboiled egg. As for the rest of the salad? It's up to you. I like to use whatever cheese I have on hand as well as onions (extra onions for my husband) and in this case, we have some radishes. Other things I like to put on my salad: artichokes, chickpeas, tomatoes, arugula, and pickled beets. *These are completely optional, add and subtract topping as you see fit! Wash and chop lettuce and distribute evenly between two plates. Roll your sliced lunchmeat and arrange on sides of salad. Slice cheese into halves as well and lay them out on the plate. I used a couple slices each, but you can use more or less to your liking. Peel hardboiled eggs and cut them in half lengthwise. Place two halves on each plate. Dice onions and slice radishes. Top salad with them. Serve with your choice of dressing and enjoy!